The average cost for a replacement garden window installation is $1000 to $4000 per window + labor costs which can average around $38 per hour depending on your local window installers average price. See local window prices below. Whether you’re trying to add space to a small kitchen, or create a convenient location for your herb garden, a garden window might fit your needs. Garden windows can really add much-needed shelf space to a smaller room in a home, and they are often more affordable than other options like bay windows. Not only do the windows help extend the space of a room, but they can function as a unique architectural feature for your home as well. When you fill the window with a variety of plants or an interesting collection a garden window will naturally draw people’s attention. 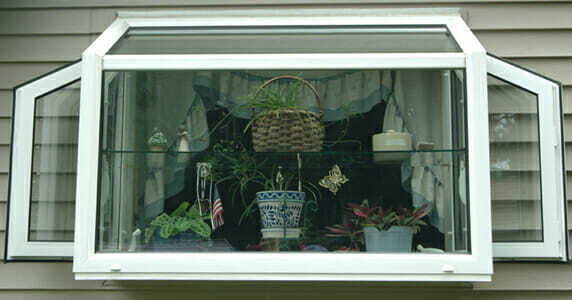 A garden window is essentially a box made from windows that juts out of the side of your home. The windows come together to create a stylish box with a bottom shelf, or multiple shelves that you can make use of. The shelves are meant to hold plants, but you could use them to hold personal items or a convenience items like spices. When looking to add an interesting and useful element to your home a garden window could be the perfect solution. It’s common for garden windows to come with side panels that open up with built-in screens. These panels are meant to serve as ventilation to help keep your plants healthy. Without proper ventilation it’s possible for plants to wither during the summer months. Be sure to check out different garden window options and make sure that they have ventilation if you plan to use them for plants. The windows that lack ventilation will likely be more affordable, but they will be more difficult to clean and less useful in your home. Garden windows with sides that open can also help you ventilate your home by allowing a cool breeze to flow through the room. While garden windows might seem like an awesome idea for your home, there are some climates where they don’t do very well. They’re generally used in moderate climates so if you live in a very cold or very rainy location you might not benefit from a garden window. Garden windows are not insulated well, and they tend to let water in so if you choose this type of window know that there is the potential risk of developing a leak. Garden windows require very precise measurements, so you should have a professional come out to your home and take detailed measurements of your space to help develop the right sized garden window. The more closely the windows dimensions match up with the existing hole, the less likely the window is to leak or let cold air into your home. When planting in garden windows you have to keep track of humidity and condensation. While a bit of added humidity from the window might actually help your plants, all that moisture could cause damage to the wood and other materials surrounding the window. Make sure that the window is sealed properly from all other parts of your home with a quality barrier. The window should be installed carefully and made to function without causing the wood around it to rot out. Whether you’re looking for added planting space, or you just want to open up your room a bit more, a garden window is a fun way to do it. While they’re less weatherproof than other window options, and they don’t offer the same level of insulation, there’s something special about attaching a little greenhouse right to the side of your home. Here are some other helpful pages to prepare you for your replacement window project.